National Marine Fisheries Service personnel inspect this dam in September 2009 on San Vicente Creek above Davenport. 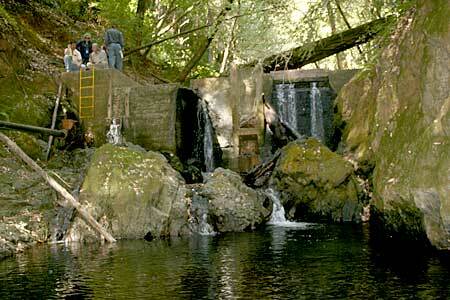 The dam diverts water necessary for coho and steelhead. A State investigation in 2001 identified that a third of the water diverted was spilled as waste. The inadequate design of this old dam can drain the creek during the driest months. Coho were listed under the Endangered Species Act as “Threatened” in 1996 and the Central California Coast population relisted as “Endangered” in 2005. A draft recovery plan as part of the endangered designation was scheduled for June 2007 with a final plan to be completed by December 2007. Now, at the end of 2009, with local coho populations at the edge of the abyss, a Recovery Plan remains elusive. In 2009 alone the Coho Recovery Plan has been delayed at least four times. Repeated delays under the Bush Administration were expected, though unwelcome. At least at one point the Obama Administration expressed a willingness to address the important values of endangered species and habitat protection. Does that commitment still hold? To make matters worse, there is no federal requirement to follow a Coho Recovery Plan once it is issued. Such a plan would establish target population sizes, which until met, would maintain the endangered status of coho in this area; however, it would lack regulatory power. Congressional representatives Sam Farr and Anna Eshoo have been helpful with previous efforts to motivate protection and restoration for anadromous fish and their habitat. In June 2009 the Chapter asked Farr and Eshoo for assistance in determining why the plan is taking so long. On the positive side, Farr’s Washington office in has expressed an interest in preparing a letter from multiple members of Congress to the National Marine Fisheries Service addressing the need to return water diverted without permit and/or spilled as waste to creeks and rivers which coho depend upon. Farr’s office was also intrigued by the opportunity to apply carbon sequester efforts to the protection and restoration of streamside habitat necessary for coho through the protection of coastal old-growth forests. At the request of Farr’s office, the Chapter has prepared background material for a second congressional letter to the appropriate agencies. At press time the Chapter is continuing its contact with Farr’s and Eshoo’s offices on this issue.